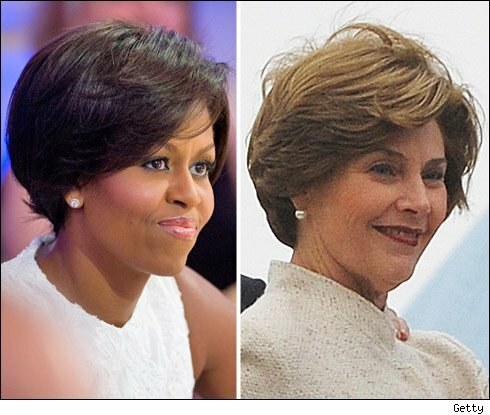 Commentary: The press to Michelle Obama -- be more like Laura Bush! You see, it was really all about "optics." The whole controversy about Michelle Obama's recent private vacation in Spain with her daughter was really just about "optics," the pundits decided. It didn't look good. Bad politics, dontcha know. "In politics and pop culture, optics are all," wrote The New York Times' Maureen Dowd, as she embraced the right-wing attack on the First Lady as an out-of-touch elitist. "And Michelle's optics sent a message that likely made some in the White House and the Democratic Party wince." That "optics" word as everywhere as Beltway sages conceded the vacation in and of itself was not inherently evil, but that it looked bad and that every First Lady has to understand that she's always under scrutiny and that "optics are all." Right. And how were the "optics" when First Lady Laura Bush got a $700 haircut for the 2005 Inauguration? Or when Laura Bush went on vacation with her girlfriends along with an entourage of 25 in tow? And how were the "optics" when the taxpayers spent more than $20 million flying the Bushes back and forth to their vacation retreat in Crawford, Texas? How were those "optics"? They were just fine because nobody in the Beltway press corps ever cared about Laura Bush's "optics." Instead, for eight years she was, without question, deemed off-limits to any sort of sustained scrutiny. First Lady Bush was off-limits in a way that her Democratic predecessor, Hillary Clinton, was not. And she was off-limits in a way that her current Democratic successor most certainly is not. Yes, the press uses a different, snarkier standard when covering Democratic first ladies. And frankly, all hell would've broken loose on the Right if anyone in the press even thought about putting Laura Bush under a partisan lens, let alone questioning her intentions. Don't get me wrong. By all indications Laura Bush was a decent, lovely and caring first lady, which is how she was routinely portrayed. But I'd suggest those terms also applied to Hillary Clinton and currently apply to Michelle Obama, and the press just doesn't seem to buy it. The press did not extend to the Democrats the same zone of privacy with which they blanketed Laura Bush. Instead, prompted by unhinged right-wing attacks, Hillary and Michelle were instantly put under a microscope by the mainstream press and forced to defend themselves and their "optics." But wait, Hillary had a hard time because she was so ambitious, right? She was part of a two-for-one deal with her husband and she stuck her nose into all kinds of policy pursuits, so of course the press treated her tenure differently. Or so went the argument at the time. Even if you buy that line, it doesn't explain the press treatment for Michelle Obama, who has adopted a very traditional approach to her first lady status. After all, is trying to get kids to eat healthy any more controversial than trying to get kids to read more, which is what Laura Bush did for eight years? And yet Obama gets tagged with the aggressive, partisan Clinton-type coverage, not the Bush-style laissez faire approach.